"It will be a tough ask but we expect that at this stage..."
Aberdeen will cross five time zones twice on their 9,000-mile round trip to take on Kairat Almaty. The Kazakhstan Premier League leaders are well ahead of the visitors in other respects too; deep into their domestic season, while the Dons are worrying about disrupted sleep patterns for their Premiership kick-off at Dundee United on Sunday. Aberdeen have had to stall on their long search for a new training complex, while Kairat have a new £15m facility at their disposal. If that hints at a financial disparity, then the recent signing of former Bayern Munich and Zenit St Petersburg star Anatoliy Tymoshchuk should hammer the point home. 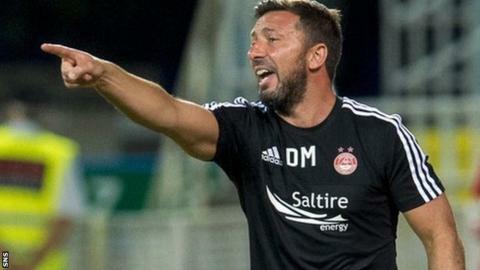 But Derek McInnes's side should not be daunted by the long journey to face well-funded opponents since they reached the third round of Europa League qualifying by dumping a Rijeka side packed with internationals, 5-2 on aggregate. And they were hugely impressive on their travels, surviving an early onslaught to prevail 3-0 on a sultry evening in Croatia. They also held their nerve when Rijeka found themselves 2-0 up at Pittodrie, responding with calm assurance and determination to level the game. "It will be a tough ask but we expect that at this stage," said McInnes looking ahead following that 2-2 draw. "But they will know they are getting a tough team at this stage of the competition too. "The distance makes the tie a bit more complicated but we'd rather be in it than watching others take part." Averaging two goals a game, Kairat eased past Red Star Belgrade and Alashkert, conquerors of St Johnstone, to progress further than they have in four previous European campaigns. Having finished third in the last two seasons, they are currently top of the pile in their league after 22 games, preparing for a split, which outdoes the Scottish Premiership in terms of complexity. Gerard Gohou, a striker from Ivory Coast, leads the country's scoring charts, while three of the squad are from Brazil and two from Serbia. At 36, Tymoshchuk is probably slowing down, although the vastly experienced Ukraine international was never keen on much more than a stroll during his pomp. While the expensive imports may catch the eye on the squad list, the player most likely to cause problems is Bauyrzhan Islamkhan. The 22-year-old skipper operates just off the front and is an established Kazakhstan international. Manager Vladimír Weiss is well-known to a former Aberdeen hero, having ruined Gordon Strachan's debut as Celtic boss with a 5-0 victory when in charge of Artmedia Bratislava. In the same 2005-06 season, Weiss's team drew home and away with Rangers in the Champions League. The 50-year-old would go on to take charge of the Slovak national side for four years before his switch to Kairat in 2012. McInnes is meticulous in his preparation and will be well versed in the strengths and weaknesses of his opponents, while he has been taking advice from sports scientists on the best way to avoid jet leg and plans to keep his players on UK time throughout. Before taking off on their chartered flight, the Dons boss might make an altogether shorter trip to Calder Park for a chat with Stuart Duff, the former Aberdeen midfielder who spent two seasons with Kairat before moving on in 2013. Duff, now playing with Aberdeen's near neighbours Cove Rangers in the Highland League, was part of BBC Radio Scotland's commentary team when Celtic faced Shakhter Karagandy two years ago. Prior to kick-off, Duff asserted that the teams at the top end of the Kazakhstan Premier League could comfortably hold their own in Scotland's top flight. More than a few listeners may have scoffed. Some 90 minutes later, Celtic were 2-0 down and needed a heroic comeback in Glasgow, complete with a last-minute goal, to reach the Champions League group stage. However, Duff may be something of a double agent since he will attending Thursday's match as a guest of the home team. With a population of 1.5m, Almaty is the largest city in Kazakhstan, with the region said to be the ancestral home of the apple. If Aberdeen's long-haul visit can bare fruit then it would set up a shot at the play-off round and some serious names in European football but McInnes will be doing all he can to keep his players grounded when up in the air.